“The song ‘Listen’ by Beyoncé [in the film version of the musical] really spoke to me while designing this collection,” says Sever. Like the lyrics of the song, which are about a young woman going out into the big world and finding the courage to have her voice heard, the dresses in this collection represent the independent bride who is confident on her wedding day. “Above all else, this collection speaks of self-love; and these gowns were created with the self-assured bride in mind—an inspirational diva who is open-minded, strong, and isn’t afraid to be the center of attention,” says Sever. In this collection that includes tulle ballgowns, French guipure lace mermaid dresses, and silk column gowns, corsets play an important part in many of the designs as a detail that shows off the modern bride’s sexiness, confidence, and strength. Shades of ash pink and white played up with shimmery silver embellishments are used throughout the range for a soft, ethereal effect, while sculptural shoulders and fitted bodices add form and structure—a contrast that aptly illustrates both the demure and powerful sides of the contemporary bride. And showstopping features like dramatic detachable trains, daringly-low backs, and voluminous skirts make each dress a work of art and the entire collection unmistakably Galia Lahav. This collection also emphasizes the fact that there is a story behind why a bride has chosen her wedding dress and what it means to her when she takes centerstage in a beautiful setting in front of her family and friends. 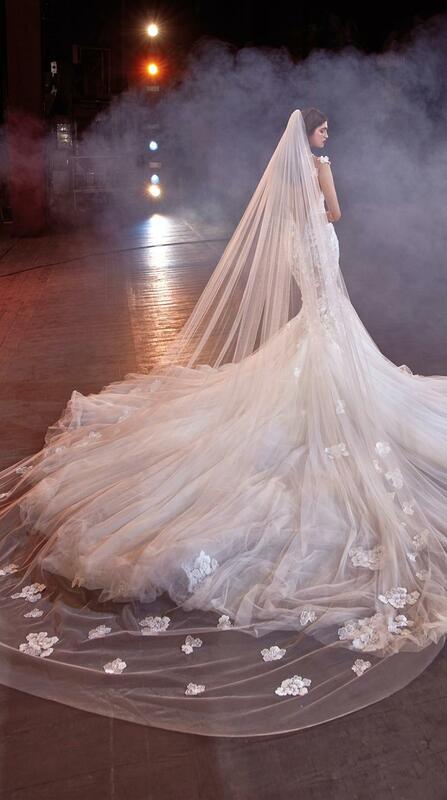 These gowns are for the bride who, as the song goes, wants the world to listen to the song in her heart.